In a large bowl (or the bowl to a stand mixer), cream the sugar and eggs for 1-2 minutes with a mixer. To this, add the flour, baking powder, cinnamon, salt and milk. Mix these ingredients well. In a separate bowl, mix the chopped apples with the lemon juice. Using a spoon, add the apple mixture to the batter and stir well, to combine. Heat vegetable oil to 375 degrees (use a deep-fry thermometer or use an electric skillet with a temperature control). It is very important to make sure the temperature is hot enough to fry the fritters correctly. Once the oil is at 375 degrees, scoop out really large tablespoonfuls of the fritter batter (as big as you can get ’em!) and carefully and gently slide the fritter into the hot oil. When they get to a true golden brown color, carefully turn the fritters over to the other side (I used two spoons to carefully flip them) and continue cooking. (This should take approx. 2-3 minutes on each side). When the fritters become brown on both sides (you might have to flip them over again to make sure both sides are brown), then you know they will be ready and cooked through. Using a slotted spoon, remove the fritters, one at a time, to a paper-towel lined (several thicknesses) plate to drain and cool. To make a glaze for the tops of the fritters, mix together the powdered sugar, vanilla and water in a small bowl until you have a nice “paintable” glaze. Using a pastry brush, brush this glaze over the entire top of the fritter. Let glaze harden slightly, turn it over and “paint” the glaze on the bottom. Place glazed fritters on wire rack; let glaze harden, then serve. If you do not like glaze on your fritters, the author of this recipe also suggests sprinkling the hot “right out of the fryer” fritters with powdered sugar and cinnamon. For mine, I used the glaze option and they were perfect. 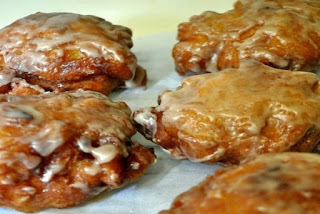 Tip #1: These apple fritters are at their very best the first day you make them! Tip #2: If using self-rising flour as substitute for all purpose flour, omit baking powder and salt from the recipe.